Holiday preparations are kicking into full gear around here. I'll bet that's true at your house, too. As I was gathering everything I need for Thanksgiving, my eyes fell on an item that took me back over 20 years. It was fall of 1991, and I was looking forward to my very first Thanksgiving as a mom. I had recently resigned from my full-time job so that I could be a stay-at-home mom, and our budget was tight. 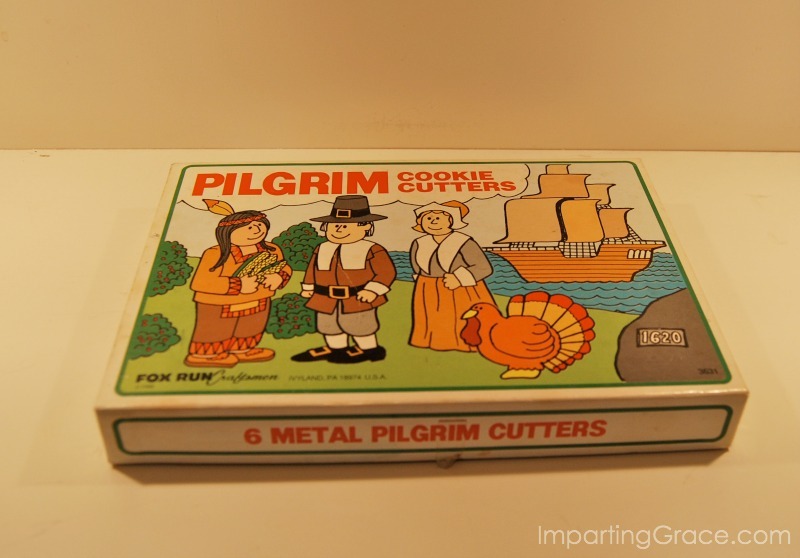 But when I saw these Thanksgiving cookie cutters at a V&S Variety Store, I was smitten. I carefully counted out the few dollars to purchase them, certain of how I would use them. I bore those cookie cutters home and tied them onto a grapevine wreath that hung in my kitchen. Then I fashioned a bow from ribbon of some autumnal color and stepped back to survey my work. Honestly, I don't think my wreath was particularly beautiful. But I was so pleased to have created a decorative accent that was just right for the season. As I think now about that moment of homemaking satisfaction and pride, I'm grateful that there was no Pinterest. It's not that I don't like social media; I do like it very much. I've often wished that I'd had all that easy-to-access inspiration back when I was a young mom. But I know myself better than that. I've always been terribly prone to comparing myself to others. And if I'd had all the beautiful inspiration of Pinterest back then, I'm guessing that I would have been ashamed of my wreath. I might have noted that the cookie cutters were just cheap ornaments from the variety store or that the grapevine wreath wasn't the right size and shape or that the bow wasn't quite fluffy enough. I might have weighed my efforts in the balance and found them sadly wanting. And I might very well have taken my little wreath off the wall, cut down the cookie cutters, and put them back in the box. Since I didn't have anything to compare it to, I simply enjoyed my wreath, that first year and for several years after. My little boys delighted in the cookie cutters, and we built lovely Thanksgiving memories. I like to think I've grown a lot since then. I love getting inspiration from Pinterest, and I enjoy sharing my own projects there. But sometimes I wonder if I end up gathering more inspiration or insecurity from perusing all the pretty pictures. What about you? Do you ever find yourself feeling discontent as you compare your things to pictures on Pinterest, or do you just find inspiration there? "I have learned to be content with whatever I have." I can become so overwhelmed on Pinterest. It sometimes confuses me more than helps me. I love, love, love the cookie cutters, they are fabulous and that box is worth a million too. Oh Richella, isn't it wonderful to be able to open that box and be flooded with memories. I'm not really a comparer. I enjoy browsing Pinterest, and over time I think my boards reflect both nostalgia and my desire to have idyllic gardens and tea parties. Have a blessed Thanksgiving. I have to say it completely enjoyed your story. You made something that gave you memories with your family. The most important thing. 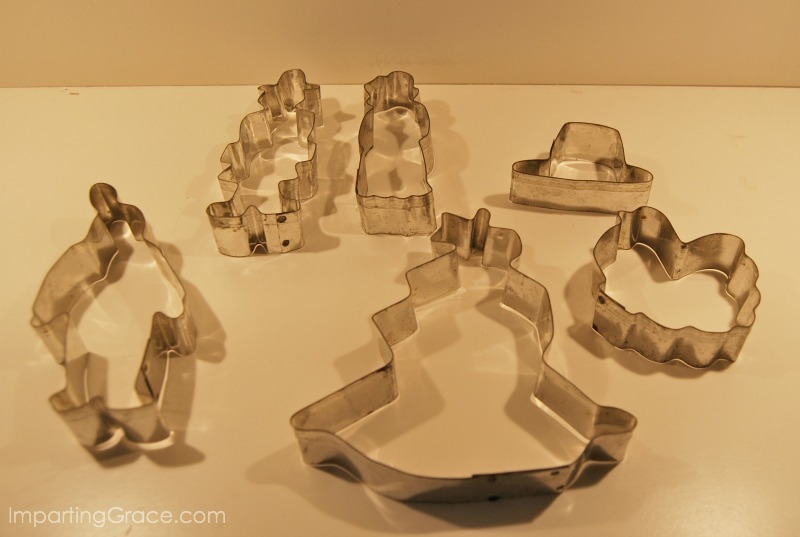 I love your cookie cutters and the sweet memories! Loved the story. Time passes much too quickly with our little ones. Looking back at making our house a home and good times with our kiddos is what life is all about. I think Pinterest, blogging, and Instagram, etc. are really the same as the magazines of our day. We were inspired, but knew ours really didn't always look exactly like that. Either designers had a hand in it, or the pictures were staged when really there was a pile of something or other right out of the picture or at least there by the next day. I always enjoyed and still do searching for inspiration, but life is just not picture perfect. It is quite messy sometimes, and in those messy moments are some of the greatest life lessons. It is kind of similar to our family portraits. We were just not the photogenic family!!!!!! However, we had some friends who were. Their portraits could have gone in the ads for the photographer. I don't think we have one that there isn't something amiss or a story behind it. But, oh the photo albums are full of sweet memories with the not so photogenic family. 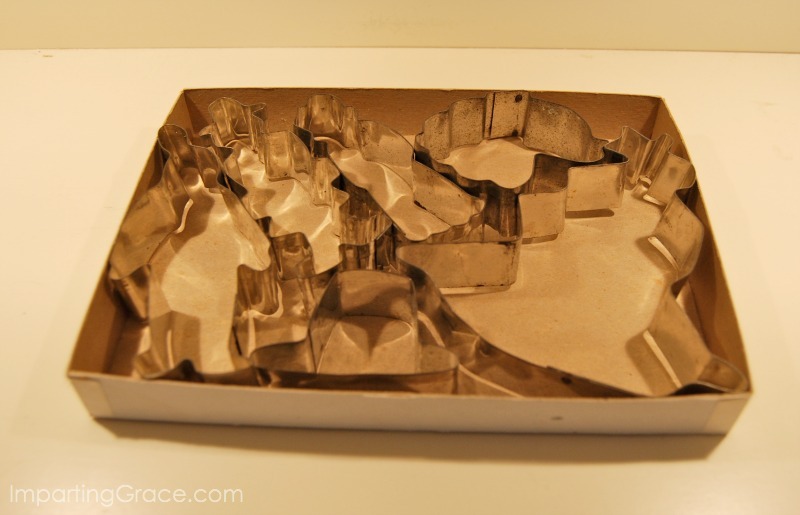 What sweet memories lie inside that little cookie cutter box! I'm sure your wreath was just adorable too. I agree with you about Pinterest...it overwhelms me too and to be perfectly honest, I rarely get on it unless I am looking for something specific. Thank you for sharing this precious memory, Richella. I am learning not to let Pinterest work feelings of discontentment or inadequacy in me, because I really do love all the inspiration that exists there. Your post serves as a good reminder that my family doesn't care about Pinterest perfect! I wish I could see your wreath! I love that an moment of inspiration hit and you went with it, your family love it, and you had nothing to compare it to -- sometimes I long for those days, but I do love Pinterest too. Love/hate relationship for sure! Happy Thanksgiving, Richella! !